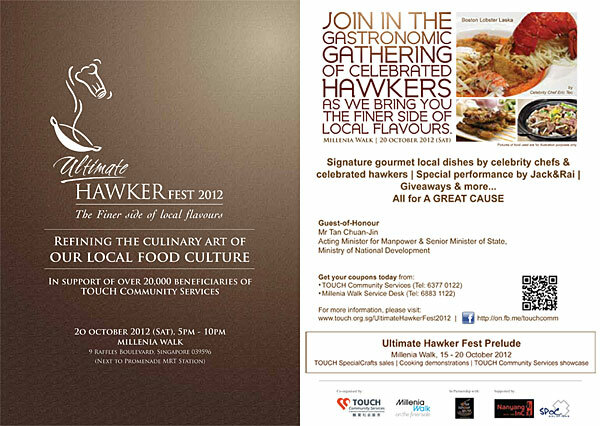 Introducing Singapore’s first Ultimate Hawker Fest 2012 – a fund-raising event featuring some of Singapore’s favourite Hawker cuisine all in one venue! Handpicked and curated by Dr Leslie Tay of ieatishootipost.sg, we invite you to this gastronomic event to savour more than 20 hawker fare with a twist, from Boston lobster laksa by Celebrity Chef Eric Teo to Wagyu beef shabu shabu by Hock Lam Beef. So grab your food coupons today and join us for an unforgettable evening at Millenia Walk. Do your part for the community while enjoying good food! Coupons are also on sale at the Service Desk located at Millenia Walk, Level One. For more information, please call Sophia Tan or Lynn Lim at 6377 0122 or email ultimatehawker@touch.org.sg.